Despite the pastoral imagery the word evokes, a landscape is as much a product of technology as of nature. Conversely, our language for computer-, code- and cloud-based innovations is full of spatial metaphors—referencing networks, websites and -scapes of all kinds. This dynamic is at the core of Technological Landscapes, a Digital + Media studio in which students explore the role of new and pervasive technologies in everyday life—and in their own research and making. “This course encourages a rigorous, long-term research process that extends beyond the studio,” says Assistant Professor Alyson Ogasian MFA 15 DM, who co-taught the course last fall with Digital + Media Department Head Shona Kitchen. Collaborating with researchers throughout southern New England, students developed projects around the theme of catastrophe: What is the relationship between technological progress—or failures—and disaster? And how can artists use digital and other sophisticated tools to communicate about catastrophes—both large and small, sudden and gradual? In previous years Technological Landscapes has focused on technology as an enhancement of human vision or a tool for revealing worlds of sound in remote locations, with students traveling to Silicon Valley, the American Southwest and other locations to conduct advanced research. Ogasian hopes that by partnering with experts outside traditional art and design disciplines, students develop a broadly informed approach to creative practice and learn to make work that is both highly imaginative and grounded in the here and now. Site-specific fieldwork far from RISD provides “a space for experimentation with interdisciplinary research,” she says. 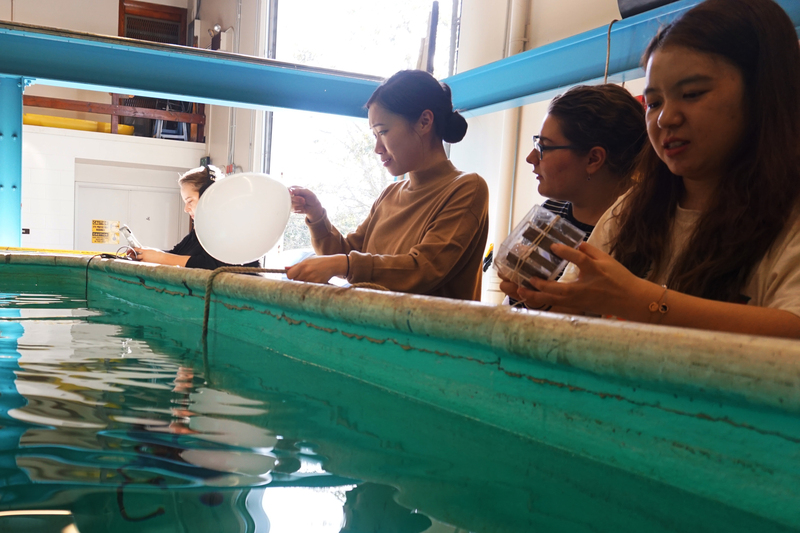 Students conducting experiments using the acoustics tank at the University of Rhode Island’s Ocean Engineering department. First-year grad student Elise Stephens MFA 20 DM sees the supportive culture in Digital + Media reflected in Technological Landscapes and says that “this environment has helped us develop a strong conceptual base” for research-driven making. 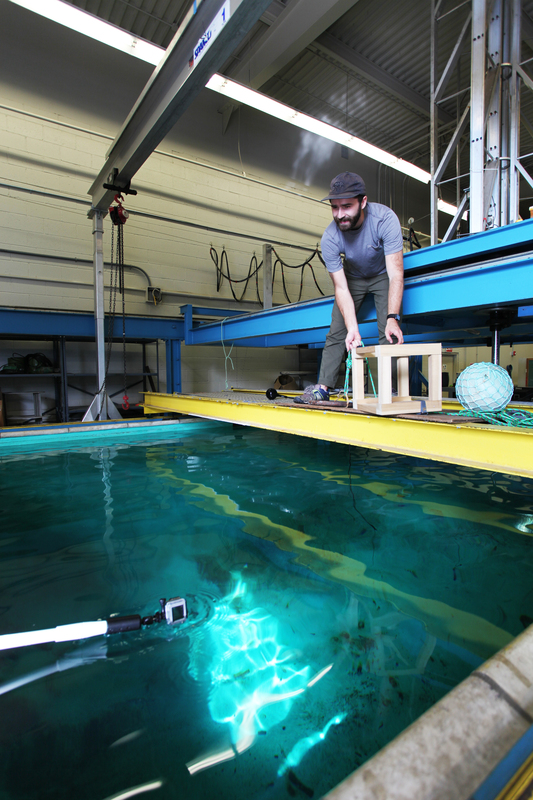 Highlighted by field research at the Woods Hole [MA] Oceanographic Institution and involving the University of Rhode Island’s Ocean Engineering department, much of this year’s studio focused on how underwater robotics, hydrophones and other data collection tools can transform marine environments into expressive media. Stephens says that seeing how experts in other fields make use of advanced technology and facilities helped open her eyes to their potential for creative work. “Because we are interested in constructing our own tools and systems,” she says, “it was invaluable to see a highly developed program” for scientific discovery. A group exhibition curated by Digital + Media faculty members Shona Kitchen, Alyson Ogasian and writer Jennifer Dalton Vincent investigates the human need to explore. Digital media fellow Rocio Delaloye MFA 16 DM helps the RISD Museum reach new audiences with bold creative content. Digital + Media grad students are teaching a trio of Wintersession studios they conceived of themselves to explore how technology shapes – and is shaped by – history and culture.